A little boy is fine and a suspect is in custody. 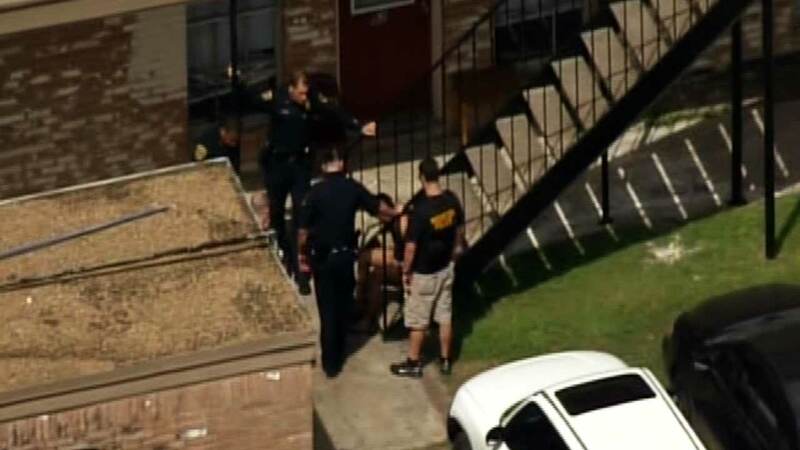 HOUSTON (KTRK) -- A baby is fine, and a mother shaken up, and now a man in police custody for snatching that child from a laundromat in southwest Houston. It all happened near Clarewood Drive and Fondren at about 2pm. A man is in police custody for allegedly snatching a child from a laundromat in SW Houston. A mother had her toddler with her while she was doing laundry. A man she didn't know but recognized as a neighbor was playing with her one-year-old son while the mother put clothes in the washer. When she turned her back, the man took off running with the child. The boy's father, who was waiting in the car, jumped into action and chased the man to the complex where they both live. Little Gustavo was lying on the ground, safe but crying. After a frantic search by air and ground, police say a canine unit found the suspect barricaded in his bathroom. He was bitten several times by the dog and needed medical attention. He was taken into custody.